2018 was the first full year where all the major NAND flash manufacturers were in volume production of 64-layer or higher 3D NAND. 64-layer 3D TLC from the Intel/Micron and Toshiba/SanDisk/Western Digital partnerships proved to be very competitive with Samsung's own 64-layer NAND, putting the largest suppliers on an even playing field for the first time in years. Intel and Micron were the second to deliver 3D NAND overall after Samsung, but their initial 32-layer generation was decidedly slow and was clearly not ready to challenge Samsung's V-NAND head-on, even though it was good enough to warrant mass production. Whereas their second generation did far more than just double the layer count: performance and power efficiency are significantly improved. With good yields and strong competition, NAND flash memory prices began to tumble in 2018. And they are expected to continue dropping in early 2019, even with plans from the manufacturers to slow or halt production capacity expansions. All of the current turnkey drive designs from the SSD controller vendors are based around 3D NAND and the transition away from planar NAND flash is now complete for every brand and product segment. SSD prices in general have been dropping faster than at any time in the past several years, and all of the price increases caused by shortages during the transition to 3D NAND have been erased. Entry-level DRAMless SATA SSDs are now down to just $20 for a 120GB drive, and 1TB drives are starting to reach $100. Mainstream SATA drives from top brands are only 30-40% more expensive, which means they'll likely also reach 10¢/GB in 2019. These lower prices mean we are also starting to see many more options for 2TB consumer SSDs, even before the widespread introduction of QLC NAND. So far, Samsung is still the only one trying to sell 4TB SSDs into the consumer market, but this is likely to change in 2019. 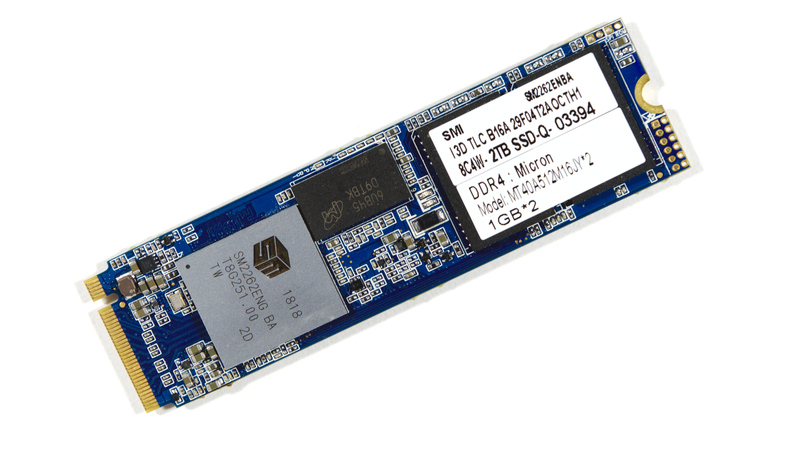 The consumer NVMe SSD market grew significantly in 2018, helped by several new SSD controller releases that challenged Samsung's dominance in this segment. Western Digital introduced their first in-house NVMe controller with the second-generation WD Black and its OEM counterparts. Combined with a switch from 15nm planar TLC to 64-layer 3D TLC, the WD Black delivered the most significant generational improvements we've ever seen from an SSD product line. But that wasn't even the biggest thing to shake up the consumer NVMe market. Silicon Motion and Phison both delivered a new generation of NVMe controllers, and their high-end chips are also able to challenge Samsung's controllers. For the first time, SSD brands that use turnkey drive designs were able to compete in this market segment, and drives like the HP EX920 and ADATA SX8200 were consistently the best value for high-end consumer storage. There are now only a handful of SSD brands that aren't offering a credible high-end competitor. The new generation of NVMe SSD controllers also brought a wider range of entry-level NVMe SSD options, including DRAMless NVMe drives that use the NVMe Host Memory Buffer feature to avoid the worst consequences of a DRAMless design. However, all of the entry-level NVMe SSDs are still significantly more expensive than mainstream SATA SSDs, and meanwhile high-end NVMe SSDs are not much more expensive than that, so this product segment doesn't offer any reasonable value so far. Part of this seems to be due to the pace of price drops across the entire SSD market: the more popular high-end NVMe drives have been more responsive with price drops than the lower-volume entry-level NVMe products, so the two product segments have seen a lot more price overlap than we would likely see if prices were more stable. High-end consumer NVMe SSDs are now providing sequential read speeds in excess of 3 GB/s, so we are closing in on the limits of a PCIe 3 x4 link. PCIe 4.0 is still far off for the consumer market, so we may be entering a period of a year or two where the NVMe market will be almost as stagnant as the SATA market in top-line burst performance numbers. However, there's still lots of room for NVMe SSDs to continue to improve random IO performance and power efficiency (which is generally worse than SATA SSDs). After several years of talk, QLC NAND flash memory finally hit the market in 2018. By storing four bits per memory cell instead of the three bits per cell of current TLC NAND flash, QLC NAND provides a nice boost to storage density and improves the resulting price-per-gigabyte. The difficulty of distinguishing between 16 different voltage levels in a single memory cell brings significant downsides to write endurance and performance, but endurance isn't as bad as was feared several years ago: most QLC SSDs are being rated for about 0.1 drive writes per day for five years, about a third of the write volume of low-cost TLC SSDs. This is still sufficient to use QLC NAND as general-purpose storage, instead of having to treat it as write-once, read-many (WORM) media with specialized software and filesystems. Intel and Micron were the first to announce their QLC NAND SSDs, starting with Micron's 5210 ION enterprise SATA SSD. Both companies introduced consumer NVMe SSDs with QLC NAND in the fall using the SM2263 entry-level NVMe controller from Silicon Motion, and Intel's first enterprise QLC drive is a NVMe SSD as well. 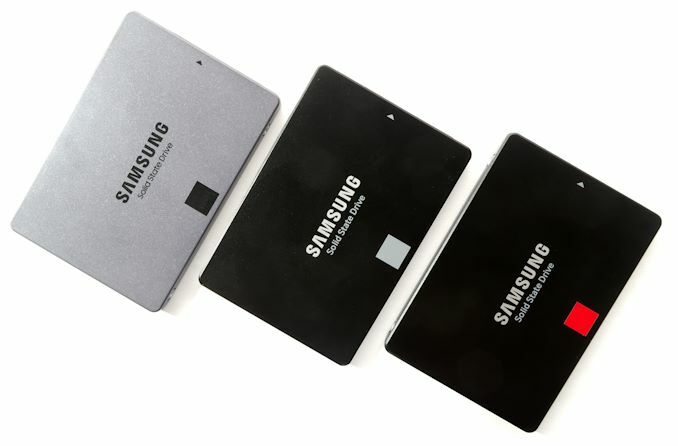 Samsung's first official QLC NAND product is the consumer 860 QVO SATA SSD. Toshiba and Western Digital (SanDisk) haven't announced QLC SSDs yet, and are likely waiting for their second generation of QLC based on 96-layer 3D NAND before ramping up QLC production. In the enterprise storage market, the role of QLC NAND is clear: to kill off 10k RPM hard drives and start competing against 7200RPM drives. In the consumer market, things are a bit less clear. With a large SLC cache, QLC SSDs with NVMe like the Intel 660p and Crucial P1 can offer high-end performance with caveats. But QLC may prove to be more popular in the SATA SSD market as an alternative to DRAMless TLC SSDs in the push toward 10¢/GB. QLC NAND is still very much in its infancy, and its growth will be one of the main storage trends to watch in 2019. 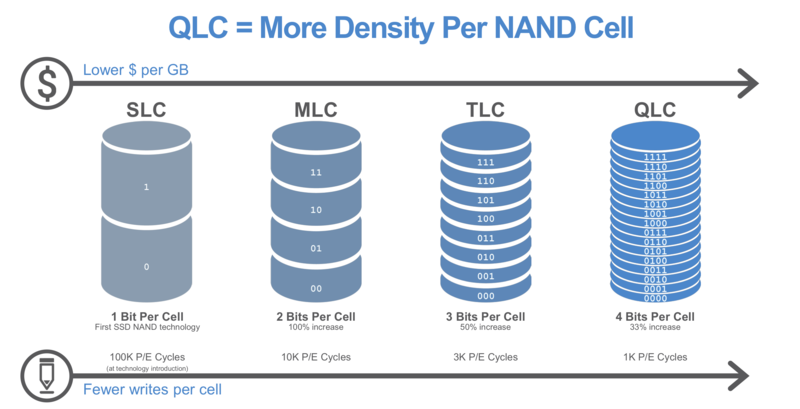 At the moment, it does not look like QLC NAND will be cannibalizing TLC NAND sales much in the near future and will instead be adding on to the SSD market in general. There are still some doubts about whether QLC is worth the trouble, especially given reports that initial yields have been so low that the cost per GB of QLC NAND is barely any better than TLC NAND. Several of the largest players in the SSD market have been engaged in a format war over the future shape of SSDs in the datacenter. M.2 SSDs have proven to be too small and too limited by their 3.3V supply and lack of hot-swap support. 2.5" U.2 SSDs are hot-swappable but tough to cool, especially when two stacked PCBs are used to allow for high capacity drives with dozens of NAND flash packages. The new first round of new form factor proposals were Intel's Ruler and Samsung's NF1. The Ruler design has been standardized as EDSFF, but has morphed into a dizzying array of variations. Samsung's NF1 hasn't been picked up by any major standards body and has attracted the ire of PCI-SIG for re-using the M.2 connector in a way that conflicts with their own future plans for M.2, but Samsung has secured several partners that are developing NF1 SSDs or enclosures/servers. So far, there's no clear resolution to the format war, but that hasn't stopped many companies from moving forward with development and deployment. These new form factors will likely never show up in the consumer market, and the first adopters in the datacenter are large-scale users that command enough volume that they are not dependent on overall market trends to get SSDs manufactured in the form factor of their choice. Intel and Micron decided in 2018 to break up their long-standing partnership for the development of flash memory. IM Flash Technologies (IMFT) was formed in 2006 shortly before SSDs started going mainstream, and it has been a major player for pretty much the entire history of the SSD market. IMFT was the second NAND flash supplier to bring 3D NAND to the market, and their development of 3D XPoint memory has spurred their competitors to respond with other low-latency memories for high-end storage, including Samsung's Z-NAND and Toshiba's more recent announcement of XL-Flash. This breakup is a major change to the competitive landscape of the solid state storage industry, but it isn't happening overnight: the breakup of IMFT was announced in several phases. 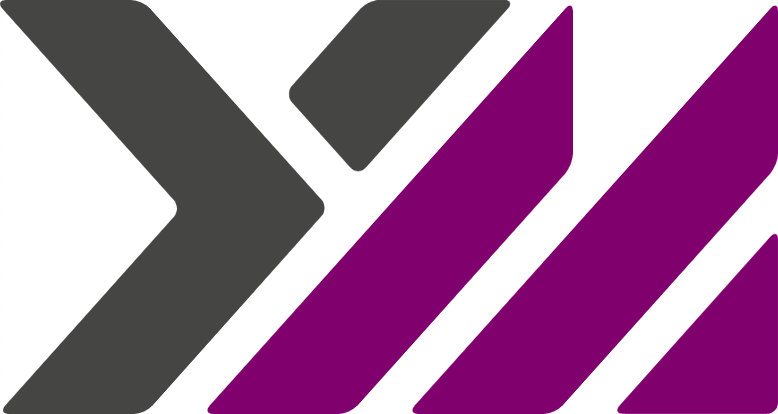 The two companies had already moved NAND flash manufacturing to their own fabs, but R&D was still a shared effort centered at IMFT in Lehi, Utah. At the beginning of 2018, Intel and Micron announced that their NAND flash R&D would diverge after the completion of the 96-layer generation, due to hit the market in 2019. Several months later, a similar split for 3D XPoint development was announced, to take effect after finishing the second generation of 3D XPoint in the first half of 2019. Micron is buying out Intel's share of the Lehi fab where 3D XPoint is produced, so Intel will have to purchase wafers from Micron until they can ramp up production at one of their own fabs. Intel and Micron are likely to take their future memory developments in very different directions. Intel is likely to focus solely on enterprise storage, where they are working toward a strategy of splitting their products between 3D XPoint for performance and QLC NAND for capacity; Intel could be the first NAND manufacturer to abandon TLC, but probably only if they can make future 3D XPoint much more affordable than its first generation. By contrast, Micron's NAND business is much broader: they're a major supplier for consumer and enterprise SSDs of their own making and their NAND is used by many other SSD brands, as well as applications in mobile, industrial and embedded markets. Micron's plans for 3D XPoint are still unclear. They haven't released any products using first generation 3D XPoint, and in the long run they may be planning to shift focus to an entirely different non-volatile memory that will be theirs alone. A New Competitor On The Horizon: Yangtze Memory Technologies Co.
China's Tsinghua Unigroup has a subsidiary called Yangtze Memory Technologies Co. (YMTC) that is trying to break into the 3D NAND market. As a late entrant to the market, their roadmap is significantly behind the competition and requires them to pull off a series of very fast paced technology iterations to catch up. They developed 32-layer 3D NAND in 2017 and are currently sampling 64-layer 3D NAND with mass production planned for late 2019. From there they plan to skip the 96L node and jump to 128L in 2020 to catch up with the more established players. The key difference that sets YMTC's NAND apart is a novel manufacturing method they branded Xtacking: rather than place peripheral control circuitry under the flash memory array (as first implemented by Intel and Micron, and on the roadmap for everyone else), YMTC fabs the two parts of the chip on entirely separate wafers. They claim to be able to bond together finished peripheral and array wafers in a single process step. Their 64-layer 3D NAND is the first demonstration of this technology. Aside from allowing for a competitively small overall die size, YMTC's Xtacking design has a few other consequences that will help them catch up. By fabricating the peripheral circuitry and memory array separately, YMTC is able to somewhat decouple the development of the two designs and iterate a bit more quickly. The peripheral circuitry can also be fabbed on a traditional logic process instead of a memory process—they're currently using a mature and thus very cheap 180nm logic process. YMTC is planning to make extremely high IO speeds a hallmark of their 3D NAND through the use of many planes per die. They are hoping to reach 3Gb/s from a single die, while the existing 3D NAND players are just starting to move beyond 1Gb/s. My outlook for 2019 is based less on new technology arriving for flash storage but rather changes around the form factor. Consumer space is still dominated by SATA with M.2 also being mainstream and offered on premium devices. It would be nice to see more U.2 drives, especially for higher capacity units. Unfortunately, U.2 still appears to be aimed at the server market despite appearing on various consumer level boards. With NAND likely to filter with the 10 cent per GB mark throughout 2019, a large 8 TB or 16 TB drive on the consumer side would be feasible (the first 4 TB consumer drives were nearly $2,000). Speaking of the server side of things, 2019 will be interesting on the SSD front. Mentioned in the article is coming Samsung NF1 vs. Ruler format war. I strongly suspect Intel will win in the long run but if Samsung doesn't make any drives for it, there will be a vacuum to fill for Ruler providers. Intel obviously has their own Optane solution for the Ruler format and Micron to cover more traditional NAND offerings. There is room for a third party to rise up in this market. I'm also hopeful we will see some PCIe bridge chips that include hardware NVMe RAID5/6 support. This would permit six PCIe 4x NVMe drives to share a single PCIe 16x uplink to the host without sacrificing bandwidth as the NVMe RAID controller handles the parity calculations for the redundant drives. For the above mentioned server form factors, this will be critical to maximizing the number of drivers per 1U chassis (currently targeting 36). HighPoint and MicroSemi have such chips on their roadmaps but they are not shipping them yet to my knowledge. It is time to see U.2 form drives in the customer market. M.2 isn't optimized for Desktop computers. Too bad. Realistically, M.2 is good enough for consumers, even the relatively small number of them that use desktops instead of laptops. We currently have 2TB on M.2 2280 cards, which is more than most consumers need or can afford. Almost all desktop motherboards have an M.2 slot that's well away from the GPU, so the drives only have to contend with their own heat production, which isn't enough to trigger throttling during real-world use.